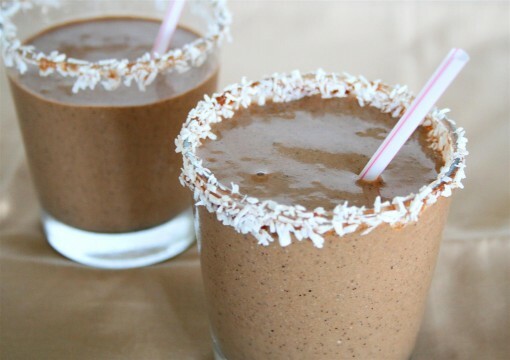 Chocolate Coconut Protein Smoothie was posted on August 20th, 2011 and is filed under Dairy Free, Drinks & Smoothies, Gluten Free, Kid Friendly, Protein, Recipes, Vegan. This entry has 19 comments. You can follow any responses through the RSS 2.0 Comment Feed. I’m learning that the less I eat sweets or dessert the less I crave them…but I’m not gonna lie…I still get cravings for it! But I think I’m starting to learn how to beat those pesky cravings. Tonight I had plain yogurt (put in the freezer a while) mixed in with Truvia and a little bit of semi-sweet chocolate chips. Everyone else had cake and ice-cream. I win! Seriously though, it really does help with sugar cravings. 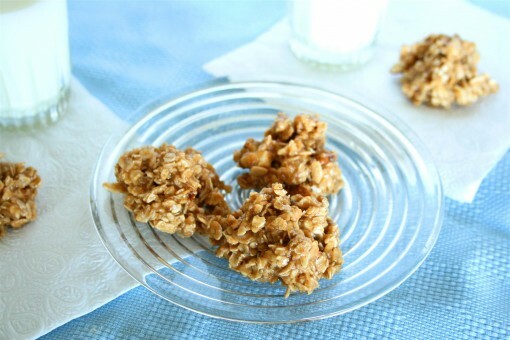 OR…there’s my latest craving buster is another way to get protein in. Yup…you knew I’d be doing a protein recipe, didn’t cha? 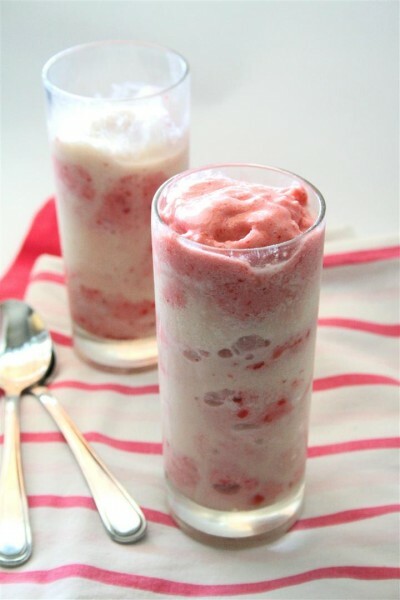 I made this recipe a couple days ago for a little sweet to end lunch with. With smaller glasses, it serves 3. 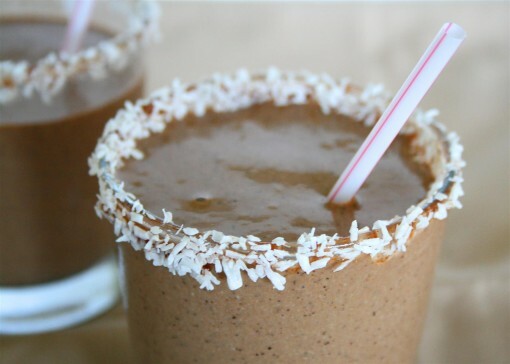 It’s coconut and chocolate…and protein. All good, right? Whiz all those ingredients into submission. Now what I did for a garnish was dip the rims of the glasses in chocolate syrup and then dipped them again into a bowl of shaved, unsweetened coconut. It’s pretty and elegant…and it gives an extra little coconut flavour with each sip! Enjoy! What do you like to pair chocolate with? Raspberries? Nuts? I think the only thing I wouldn’t pair chocolate with would be broccoli. It goes with almost everything, right? Wow, I can’t wait to try this! 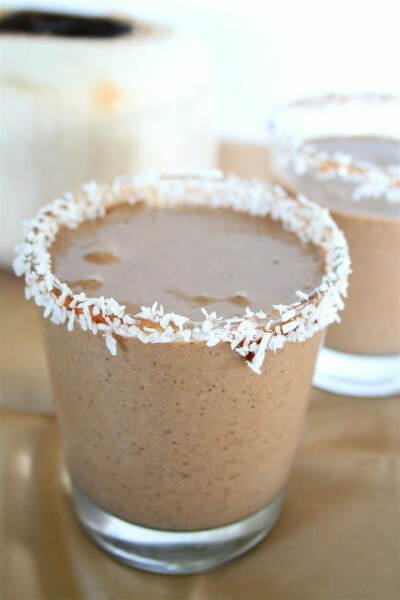 Way healthier than those mocha coconut frappucchinos I’ve been craving lately! So unique smoothy. I bet those coconut milk are as creamy as the commercial milk. I want this one. I love my sweets and if they give me the proteins I need after my workouts then they’re even better. hehe. wow, it looks delicious!!! desserts are the best! I love chocolate protein smoothies. So delicious! I love the smoothie. I make a protein smoothie every morning, and they never look as good as yours. I’m thinking ill invest a little more time and resources and make one of these. Wonderful. MmM looks delish. I like chocolate and coffee together! Thanks for the delicious recipi. Loved it!